Most of us are familiar with material handlers. They drive lift trucks, push carts or carry plastic tubs of materials to their point of use. In Lean, however, we try to eliminate this non-value adding job by placing materials close enough to the operator that the operator can easily retrieve them. There are times, however, when material replenishment requires someone other than the operator. For these tasks, we turn to a water spider. FUNCTION: The function of the water spider is to replenish the materials used at each station so that the production personnel can focus on the process of adding value. Once every Takt Time* the water spider walks the entire length of the assembly line and places the exact materials required to make one product at each station. 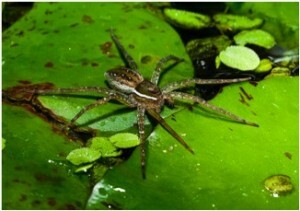 The water spider then returns to replenish and starts all over. Water spiders are typically only used when Takt Time is three minutes or greater. So, when might you use a water spider? Usually three things govern their use. They are: exact part, exact place, exact count. EXACT PART: When the product varies and different parts are required each time it is assembled, the water spider is used to place the exact parts required for the next assembly at each station. The change in part(s) often signals the assembler what product they are to build next. EXACT PLACE: Placement of parts can be critical. When an operator knows that a part is always in the same place, they don’t have to take their eyes off their work to grasp the next part. This allows them to devote their full attention to their work. EXACT COUNT: Count can be used as a quality check. When the operator knows that the water spider has placed the exact number of parts in the exact place, it allows them to perform an ongoing quality check. If they run out of parts early, it means they’ve assembled a part in the wrong place. If there are parts left over, the assembler stops the line, because the product is not fully assembled. WHO: One might think that a water spider is an entry level job, but it is not. The water spider is usually the most experienced assembler on the line. They understand the product being built, how to perform every step in the production process, how it is tested and what quality checks are performed on it. Should anyone need to step away from the line, the water spider can backfill any position. * When part count is not critical and parts don’t vary from product to product, the water spider might place enough parts at each station to make multiple products. When this occurs, the water spider walks the entire line in multiples of Takt Time; e.g. if Takt Time is 300 seconds, the water spider might walk the line every 1,800 seconds (30 minutes) and place six new parts at each station. The water spider may also be used to move finished goods at the end of the line before returning to replenish. Getting to Leanbusiness Flow JIT Lean Thoughts SavingsWhat’s a Water Spider?